The landscape of PC games and video games, in general, has changed dramatically from the early days of classic DOS games and the IBM PC. There have been so many advancements in both PCs and video games from hardware advancements to software development, but no matter how pretty or advanced the game is, the true test of a game comes down to one basic principle; Is the game fun to play? There has been a resurgence in retro style games that are extremely fun to play, but some of the best gameplay can still be found in classic DOS games. 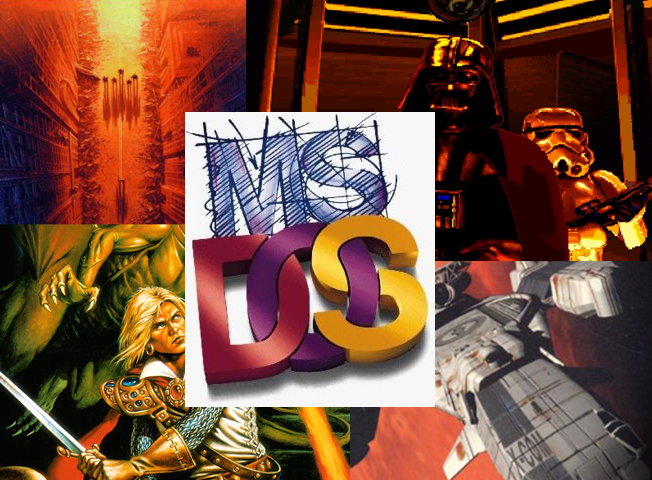 The list that follows includes some of the best DOS Games that are still fun to play and worth the minimal requirements to install. Many of the games can be found on video game digital download sites such as GOG and Steam, while others have been released as freeware. The original Wasteland was released in 1988 for MS-DOS, Apple II, and Commodore 64 computers. The game has seen a resurgence since the successful Kickstarter campaign and release of Wasteland 2 in 2014 but it has long been praised as being one of the best games in PC gaming history and a classic DOS game. Set in the late 21st century, players control a band of Desert Rangers, the remnants of the U.S. Army post-nuclear war, as they investigate mysterious disturbances in areas surrounding Las Vegas and the desert of Nevada. The game was ahead of its time with a robust character creation and development system, with customizable skills and abilities for characters as well as a rich and compelling storyline. The game and can be found on a number of freeware and abandonware gaming sites, but it has never technically been released as freeware. These versions will require DOSBox. The game is also available on Steam, GOG, GamersGate and other download platforms. X-COM: UFO Defense is a turn-based sci-fi strategy game from Mircoprose which was released in 1994. It includes two distinct game modes or phases that players control, one being the Geoscape mode which is basically base management and the other being Battlescape mode where players will equip and control a squad of soldiers out on a mission investigating Alien crash landings and invasions of cities. The Geoscape portion of the game is extremely detailed and includes research/technology tree that players must allocation resources against, manufacturing, budgeting and more. The Battlescape is just as detailed with players controlling every soldier in the squad using time units to move into cover, shoot at aliens or reveal portions of the map yet to be explored. The game was an overwhelming success when released, both commercially and critically with five direct sequels and a number of clones, homebrew remakes, and spiritual successors. After an 11 year hiatus, the series was rebooted in 2012 with the release of XCOM: Enemy Unknown developed by Firaxis Games. Even after 20+ years since its release X-COM: UFO Defense still offers up some great gameplay. No two games are ever the same and the depth of the technology tree provides a new approach and strategy with each play. A free download of the game can be found on many abandonware or DOS dedicated websites, but it is not freeware. Commercial versions of the original game are available from a number of digital distributors, all of which work with modern operating systems out of the box and do not require players to be proficient with DOSBox. Pool of Radiance is the first computer role-playing game based on the Advanced Dungeons & Dragons tabletop role-playing game for the PC. It was developed and released by Strategic Simulations Inc (SSI) and is the first in a four-part series. It is also the first "Gold Box" game where D&D games developed by SSI featuring a gold colored box. The game is set in the popular Forgotten Realms campaign setting in and around the Moonsea city of Phlan. Pool of Radiance follows the second edition ruleset of Advanced Dungeons & Dragons and players begin the game as any AD&D or D&D game starts, with character creation. Players create a party of up to six characters from various races and character classes and then begin their adventures by arriving in Phlan and completing quests for the city that include things such as cleaning out sections that have been overrun by evil monsters, obtaining items and general information gathering. Character leveling and advancement follows the AD&D rules and the game also includes many magical items, spells, and monsters. Despite the years since its release, the gameplay and character development in Pool of Radiance is still top notch and the ability to carry characters over to the sequels makes it all that much more fun to replay the entire gold box series of games. The game can also be found on a number of digital distribution sites such as GOG.com under the Forgotten Realms: The Archives Collection Two combo pack which includes all of the gold box titles from SSI. Like many of the other games on this list, Pool of Radiance can be found on a number of abandonware websites but it is not a freeware title, meaning downloading is at your own risk. All versions require DOSBox in order to play but the GOG version will have DOSBox built in and not require any custom setup. Civilization is a turn-based strategy game released in 1991 and developed by Sid Meier and Microprose. The game is a 4x style strategy game where players lead a civilization from 4000 BC through 2100 AD. The primary objective for players is to manage and grow their civilizations through the ages competing with up to six other AI-controlled civilizations. Players will found, manage and grow cities which in turn expand the domain of the civilization eventually leading to warfare and diplomacy with other civilizations. In addition to warfare, diplomacy and city management, Civilization also features a robust technology tree in which players are free to choose what to research and develop to advance their civilization. Also, know as Sid Meier's Civilization or Civ I, the game has been widely praised by critics and gamers alike with many calling it the best PC game of all time. Since its 1991 release, the game has given rise to the multi-million dollar Civilization franchise that has seen the release of six games in the main series with a seventh planned for late 2016 and numerous expansions and spin-off games. It has also spawned a number fan inspired remakes and homebrew PC games that recreate many of the same aspects of the original Civ I. These features are what makes it still worth playing today some 20+ years since its release. No two games are the same and the variety of the technology tree, diplomacy and warfare make it different and challenging each time. In addition to being released for the PC, it was also released for the Mac, Amiga, Atari ST, and many other systems. There was also a multiplayer version released titled CivNet that featured various methods to play with others online. Currently, the original Civilization is only available on abandonware websites and will require DOSBox, alternatively, there are a number of freeware remakes including FreeCiv which can run in either a Civ I or Civ II mode, emulating the original commercial games very closely. Star Wars: X-Wing was the first space flight simulator game from LucasArts for the PC. It was widely praised by critics and was one of the best selling games of 1993, the year it was released. Players take on the role of a pilot for the Rebel Alliance as they battle against the Empire in space combat. The game is broken into three tours each having 12 or more missions each. Players will control either an X-Wing, Y-Wing or A-Wing fighter in the missions, with the goal of completing the primary objective before you can move onto the next mission and tour. The game's timeline is set just prior to A New Hope and continues through to the end of that story with Luke Skywalker attacking the Death Star. In addition to the main game, there were two expansion packs released, Imperial Pursuit and B-Wing which continues the storyline after A New Hope up to The Empire Strikes Back and introduces the B-Wing fighter as a new flyable ship. Star Wars: X-Wing can be purchased through GOG.com and Steam as Star Wars: X-Wing Special Edition which includes the main game and both expansion packs. Steam also has an X-Wing Bundle which includes all games from the series. Warcraft: Orcs & Humans is a fantasy-based real-time strategy game released in 1994 and developed by Blizzard Entertainment. It was the first game in the Warcraft series that eventually led to the immensely popular massively multiplayer online RPG World of Warcraft. The game is widely considered a classic in the RTS genre and helped popularize many multiplayer aspects that are found in virtually all real-time strategy games that have been released since. In Warcraft: Orcs & Humans players control either the Humans of Azeroth or the Orcish invaders. The game contains both a single player campaign as well as mulitplayer skirmishes. In the single-player mode, players will go through a number of objective-based missions that typically involve base building, resource gathering and building an army to defeat the opposing faction. The game was very well received when released and holds up well to this day. Blizzard released two sequels, Warcraft II and Warcraft III in 1995 and 2002 respectively and then World of Warcraft in 2004. The game is not available through Blizzard's Battle.net but it is available from a number of third party websites. Many of these sites list the game as abandonware and offer the original game files for download but the game is technically not "free". Physical copies of the game can be found on both Amazon and eBay.